Skin Design London recently introduced a new addition to its debut range, the Volume Q Sculpt & Lift serum. I was recently sent a sample to try. Given my total obsession right now with skin lift, this has been one eagerly-awaited test drive. Before talking about that product, I want to give a quick overview of the Skin Design London story. The brand was founded by sisters Fatma Shaheen and Gulcan Arikan, the team behind London¹s award-winning Azamay clinics . The skincare range has been created as an extension of their clinic work. As well as containing highest grade active ingredients, all products are skin kind, cruelty-free, and without parabens or animal-based ingredients. So, on to Volume Q Sculpt & Lift Serum. Goodness, I’ve read some big claims for skin lift/tightening serums before but perhaps not quite like this. It’s described as a ‘remarkable’ serum showing ‘incredible’ results within just two weeks. It’s designed to give volume to lines and wrinkles (think nasolabial (NL) folds, cheeks, under eye hollows etc) by activating collagen and stimulating skin’s fibroblasts. - 179% increase in the synthesis of Collagen I in aged skin. So what are the key ingredients doing the work? 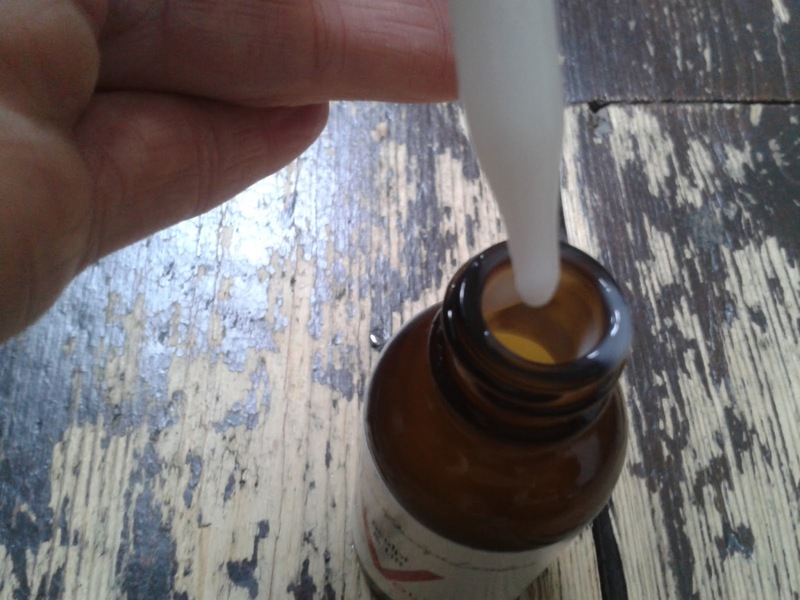 The serum comes in a 30ml bottle, with a dropper dispenser. Apply 2-3 drops morning and night, after cleansing. It is white and quite thick, so it’s easy to load the correct amount via the dispenser. The formula absorbed extremely quickly into my dry skin, so I found it helped if I spritzed it with facial water first. I would leave for one minute to fully sink in before applying moisturiser. I’ve always been sceptical of topicals claiming to lift and add volume. I think it’s a tricky thing to pull off. It’s difficult too to be sure of lift results outside of a clinical trial or some other form of skin analysis such as a Visia scan. As anecdotal evidence is not the most reliable, I took snaps before the start of the trial and then again about a month later, to get a photographic measure (apologies for slight difference in lighting – it’s not something I can control – but the results stand). 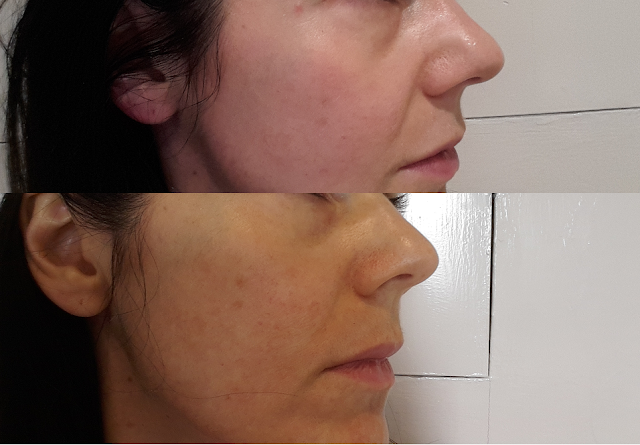 Just shy of two weeks into the trial, my skin felt tighter around the jaw area. 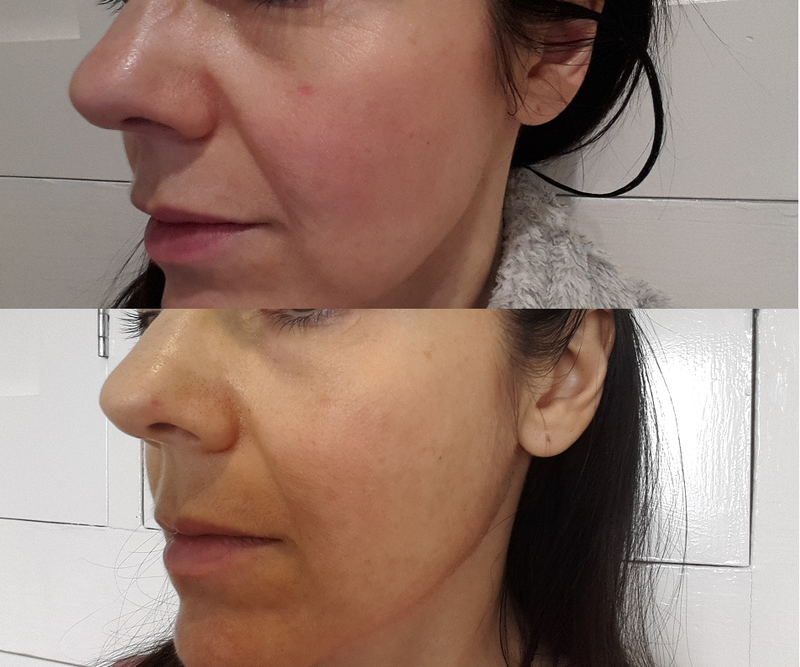 It didn’t feel artificial, like a sudden tightening as the formula settled into the skin (akin to my experience with REN Instant Firming Beauty Shot). This was my own skin, only tighter. A month into the trial and my skin remains firmer – something I’ve noticed when applying skincare. There’s also been lift around the NL lines. 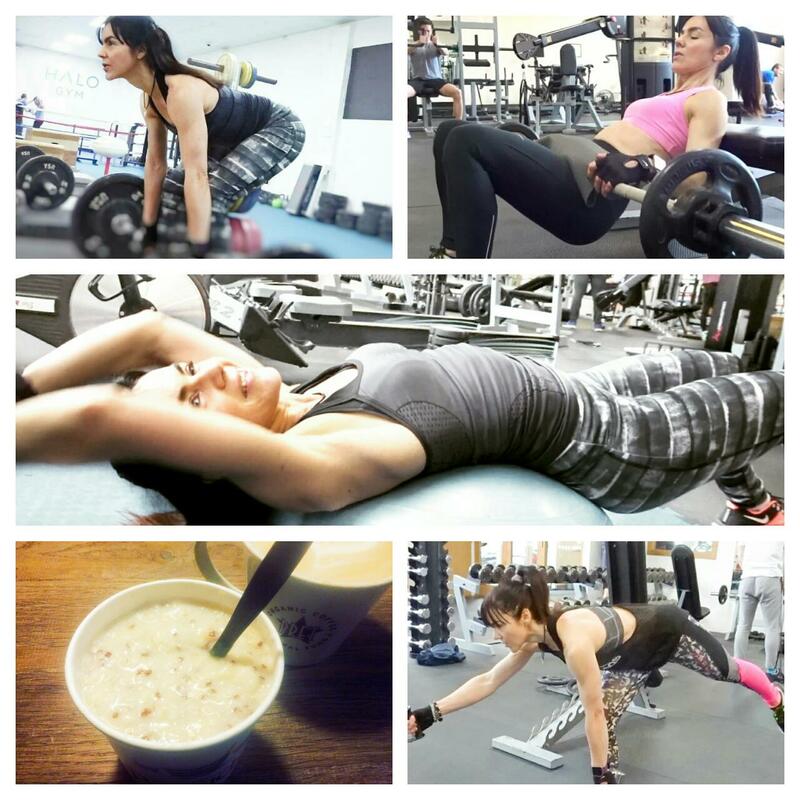 Yes lift! It’s subtle, but to get any lift with a topical is unexpected. My before and after pics also show a reduction in wrinkle depth around the eye area. I am thrilled with the results, and I don’t want to lose them. However, there is a sting. A 30ml bottle costs £140. Ouch! It’s not an exact measure, but I reckon I have used up about half the bottle so far. Ongoing maintenance costs are something to consider, especially when facing a level of commitment like this. 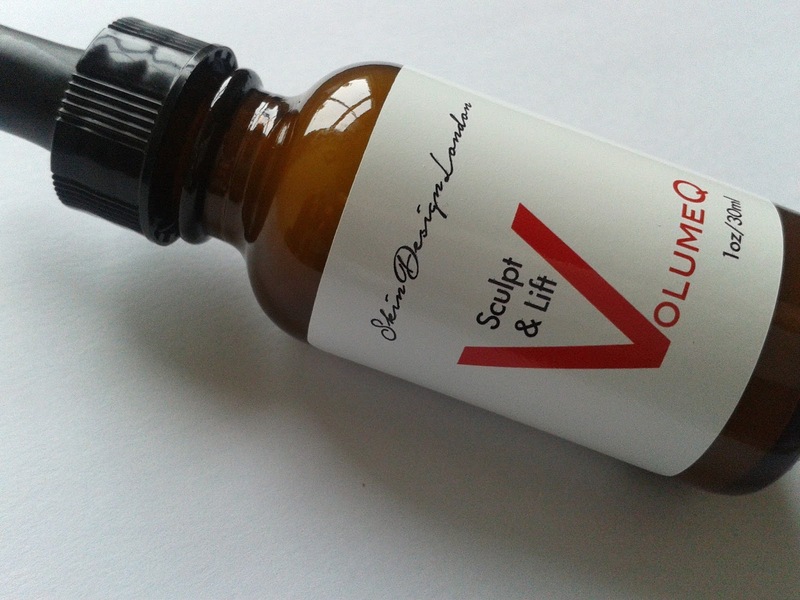 The Volume Q Sculpt & Lift serum is available to buy via the Skin Design London website. Wow! £140 a bottle! For that price one would seriously expect miracles! Sounds like a very effective product though, but well out of my budget. I like the idea of tightening! Pricey, but it sounds like it may be well worth it! T.